This Sarah Chang compilation (could surely have had a longer playing time?) is the sort of mood music the title suggests. The album draws on Ms Chang's recordings for EMI. Her artistry is beyond doubt but it is unfair to put together so much andante in a single album. As an attentive listening experience this is too much of a good thing. This concept album holds a mood and will no doubt work well as background to a meal or even as aural 'paint' in an arts and crafts shop. There are thirteen tracks of which six are with orchestra; the remainder with piano. The only complete orchestral work is the Saint-Saens Introduction and Rondo Capriccioso the hushed mystery of which flows with ardent life. I would love to hear Chang in Havanaise or Schmitt's Habeyssé. 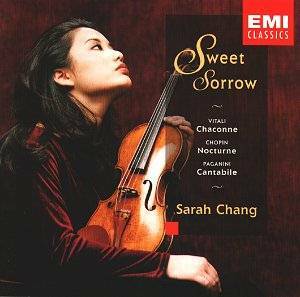 Otherwise we have mood-consistent cullings from other works: Tchaik Violin Concerto (andante) and two movements from the Lalo and Vieuxtemps warhorses (Espagnole and No. 5). The Vitali Chaconne (with orchestra) establishes the heart-slowing mood quickly. Other tracks by Paganini (not the fireworks but the serenades! ), Chopin, Liszt, Sibelius and Brahms are all on message. Some variety is briefly offered in the flashy con fuoco from the Vieuxtemps and Brahms' Hungarian Dance No. 1. The liner notes are what you would expect. Devastatingly successful as mood music. Just too much for general listening. Ultimately a credit to only one aspect of Chang's undoubted artistry.